VPS vs VPN, What’s the Difference? Which is better VPS or VPN? When it comes to Internet security, virtual is the way to go if you want to keep your connections, data and surfing private but which is better VPS or VPN? What is the difference between VPS and VPN, Virtual Private Service and Virtual Private Network? Aside from the word Virtual in their names, and the fact they are both being sold as a service across the web, there is not much in common between the two. On the one hand you have a dedicated operating system hosted offline and offered as a service, on the other you have a network of dedicated servers that facilitate anonymous and secure use of the Internet. They are both incredibly useful when it comes to Internet safety but perform different tasks. What is a virtual private server / VPS? A virtual private server is, in effect, a virtual machine. It is a server, hosted online, that runs a dedicated operating system accessible through subscription. The server is able to install and run any types of software, applications or programs a real computer can with the exception it isn’t your computer. If the application causes a crash, contains malware or viruses, the “computer” on the virtual private server is the one that is damaged. Your machine remains safe. What is a virtual private network / VPN? A virtual private network is a network of dedicated servers which run the VPN service. The VPN service facilitates anonymous, secure connections to Internet so users can maintain network integrity, keep their connections safe from hacking and in most cases, encrypted so if there is a breach whomever or whatever hijacks your data won’t be able to read it. What are the VPN And VPS differences? The differences come down to one major detail, the tunneling protocol. While it is possible to connect to your VPS and use the virtual machine to host a web browser and then use that web browser to surf the net, you are not getting the internet security available with a VPN. The connections are not hidden, the IP addresses are not masked, the connection is traceable and worse yet, it is not encrypted. A VPN is only used for one thing, safe secure anonymous untraceable encrypted connection to the Internet. It’s not a matter of which one is better, it is a matter of using the right tool for the right purpose. A VPN keeps your connections private and safe, a VPS keeps your devices and machines safe. Believe it or not, you can use a VPN on VPS, or connect to a VPS with a VPN. The only catch is that some VPS providers don’t allow installation of VPN on their servers and in other cases it takes considerable programming skill to accomplish. However, if you are able it will give the benefits of both protocols. The VPN will keep your connection private and untraceable so you can log in to the VPS without anyone the wiser. Then you can use the VPS to open suspicious emails, or to log into websites that may install malware or run programs from unknown providers without fear of damaging your machine. Want to avoid all the headache but ensure your internet security? Simply sign up to a reputable VPN service by Le VPN, one of the market leaders in Europe and internationally. 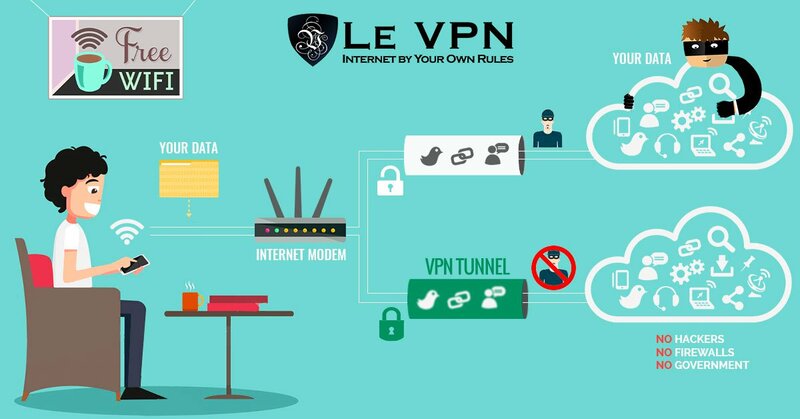 Le VPN plans start from $4.95 per month and guarantee your maximum safety and privacy online.